SEO for photographers can be a challenge, but there's no need to get overwhelmed or confused by the technical details. Get found by more of the right clients with SEO made simple. It used to be easy to create a photography website, add the right keywords, and get Google to list your pages in the search results. Today, it's a bit more difficult, but still possible if you follow these simple SEO guidelines. Few business and marketing challenges cause more frustration than does SEO for photographers. Search engine optimization is one of those hot topics almost guaranteed to spark heated discussions or even cause arguments. I’ve witnessed some pretty spectacular flame wars erupt in the Facebook groups I belong to, so I know it has the potential to cause trouble! My personal experience with SEO is extensive, and I’ve worked with professional photographers just like yourself for many years. In fact, one of the constant problems I see people struggling to overcome is getting their website listed by Google. Being found by the right people looking for a photographer has become one of today’s toughest marketing challenges. There was a time when all you needed to market a photography business online was a website and some basic knowledge of search engine optimization. Back in 2004, when I started my portrait and wedding photography business here in Memphis, I built a website from scratch, figured out which keywords I needed to target, and optimized my content to keep Google happy. Of course, my technical IT background helped a lot, but the SEO part wasn’t anywhere near as challenging as coding a website by hand, for example. Within a couple of months, my content ranked at the top of page one for many searchers in the area, and I had more than enough website visitors to keep me busy. And it stayed that way for a long time. Soon, other photographers asked me to help them achieve the same results, so I happily showed them the basics and off they went. Fast-forward to today, and we find a different picture altogether. Google has plugged all the loopholes (not that I ever did recommend dubious SEO tactics in the past), and the top spots in the search results are occupied by established photographers who are hard to dislodge. What’s a new professional photographer to do? What’s possible if you just want to improve your own search rankings? This is where jumping into SEO gets tricky for photographers these days. There’s no gaming the system anymore, and no easy way to finagle your way to the top of Google. There’s no guarantee your website will show up in the search results if all you have is a place to showcase your photographs and you don’t write enough text or have a good-quality blog. By following some simple guidelines and creating quality content for your photography customers, you can make an impact in the search results and get your photography noticed by Google. To help their customers (people looking for stuff) to find the most relevant and useful online resources for their current needs. If we can help Google to do their job, and we do it in ways they approve of, then this can be done. But it doesn’t necessarily mean it’s going to be “easy”. In fact, SEO for photographers can be a difficult (but fun and rewarding) challenge to take on. However, you must be prepared to work outside your comfort zone on some things, such as writing content or producing videos, but I promise you it’s well worth the effort. This guide is intended to help make it less difficult, take less time, and get you faster results. 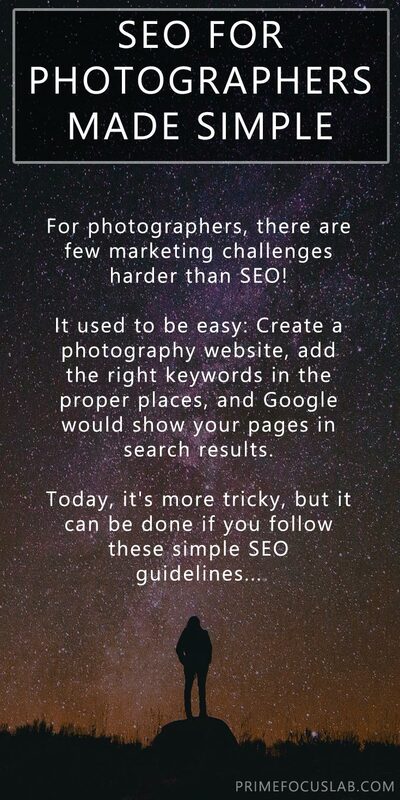 Ready to take up the SEO for photographers challenge? How Does SEO Work For Your Photography Business? I get asked the question "how does SEO work?" all the time by photographers who want to a better understanding of how to get listed in Google. The answer isn't as complicated as many people assume it will be, and you don't have to know the full technical details in order to make it work for you. Here's a quick rundown of what you do need to know. No one can hire you if they can't find you and, to do that, you have to make sure your web pages are listed in the Google search results in response to the most appropriate search phrases your potential customers are using to look for a photographer. But doing keyword research can be more of an art than a science at times, and everyone has their own unique set. Here's how to find yours. Do you have a website content SEO strategy, or are you doing SEO on a page-by-page or post-by-post basis as and when you think you need to? If you don't have a plan, you could be hurting your SEO efforts, so here are some tips and ideas on how to structure the SEO for your photography website to avoid many of the most common problems. Blogging can be a challenge in itself for many photographers, especially if they lack confidence in their writing, so it can help tremendously not to have to worry about the technical aspects of SEO for blog posts. Here's how. Links are like the currency of SEO on the Internet. Generally speaking, the more links you can get pointing to your web page the higher its perceived authority and the the higher it will rank on Google. Of course, this is a simplified view and you'll see in the next section that not all links are created equally. The best links are those you naturally attract by virtue of having good content, but here are 5 ways you can increase the chances of acquiring more valuable links to your content. You've already learned the value of attracting links to your content from other website owners, and every link is worth something. However, not all links are created equal, and some are worth a lot more than others. Understanding why this happens is important when it comes to running a link-building strategy for your photography website, as you don't want to waste too much time focusing on the wrong things. Does search engine optimization (SEO) keep you up at night wondering how to get around Google's ranking algorithms to get your website on page one? Having trouble finding the best "how-to" articles with tips, tricks, and SEO secrets on how to do SEO? You might be chasing ghosts because SEO is not what most photographers think it is, and you could be wasting valuable time on stuff that just doesn't work!